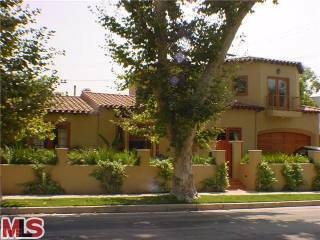 The updated Spanish at 10348 Calvin Ave LA CA 90025 received an 8% or $100,000 price reduction this week, down to $1,150,000. This house is a short sale and has been on the market 162 days, starting at $1,295,000. Even though its a short sale, the house looks to have been verbally approved to sell short by the bank according to the listing agent's remarks on the MLS. The home has been remodeled throughout and is in move-in condition. According to the MLS, the home is a 3 bedroom / 2.5 bath, 2,372 sq ft of living space on a 5,009 sq ft lot. Two of the bedrooms are located downstairs, as the master is upstairs. The home also features a small patio backyard with a spa that has swim jets.